Beazley is a major London Market carrier with 400 users of the solution across seven countries. Key users include underwriters, Capita, risk management, UW support staff and claims managers. 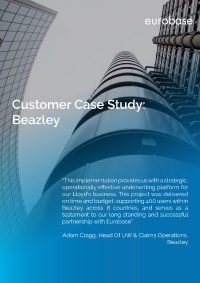 In 2010, Beazley needed to review their options for a strategic underwriting platform to support their planned Lloyd’s long term growth. Find out the significant benefits that Beazley has achieved with synergy2. 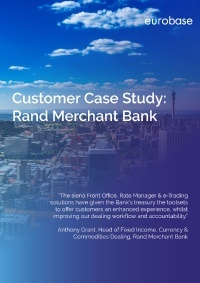 FirstRand Bank Limited is a leading African corporate and investment bank and part of one of the largest financial services groups in Africa with a broader financial services proposition (not only banking). They offer innovative, value-added advisory, funding, trading, corporate banking and principal investing solutions. As the investment banking arm of FirstRand Bank Limited, RMB has a footprint across 35 African countries and offices in Namibia, Botswana, Nigeria, Angola and Kenya. RMB also operates in the UK, India, China, and the Middle East. Saudi Re is the first reinsurance company in Saudi Arabia, providing facultative and treaty reinsurance business to clients in more than 35 countries across the Middle East, Asia, and Africa. It writes non-life and life business and has particular expertise in engineering, property, marine, casualty, motor, and life lines of business. Saudi Re has been able to establish itself as a strong multinational player and grow significantly recording an annual average growth of 50% over the last five years. Zenith Bank (UK) Limited is the UK subsidiary of Zenith Bank Plc, one of the leading banks in Nigeria offering an extensive range of Trade Finance, Lending, Wealth Management and Treasury products and services. BACB is a wholesale bank and a leading provider of trade and project finance for Arab and Mediterranean markets. Based in London, BACB offers its clients a full range of treasury products, market making and price quoting facilities in all major and emerging Arab and Mediterranean currencies. 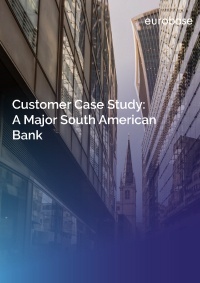 Our customer is one of the largest banks on the South American continent and Eurobase has been providing solutions and services to them since 1998. 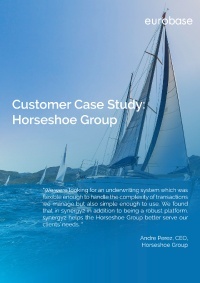 In 2010, the bank made a strategic decision to implement global best practices and standardise processes across its international operations. 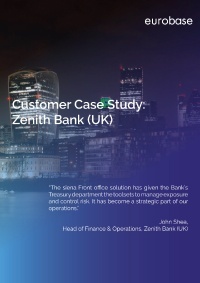 In line with this strategy, the bank chose to upgrade its current siena Front Office London solution and roll it out with the Oracle Flexcube® core banking solution to its major international offices. 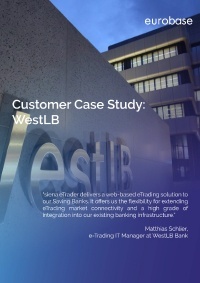 WestLB AG is a European commercial bank with firm roots in North Rhine-Westphalia, Germany´s largest federal state. It is the central institution for the savings banks in North Rhine-Westphalia and Brandenburg, and as an internationally operating commercial bank it acts as their link to the global financial markets.